In schools throughout the United States, technology and 21st century learning skills have become a major priority in our educational system. Technology is highly encouraged to not only prepare students for their future careers, but also for active learning and engagement while in school (Moersch, 1995). No matter what level of technological expertise or the amount of access to technology at any particular school site, nearly all teachers throughout the nation are in one way or another using, or at least becoming aware of, technology and its new role in the classroom. (Sheingold & Tucker, 1990) It is crucial, especially at the high school level, to prepare all students for the 21st century challenges they will be faced with when entering into higher education or the work force. 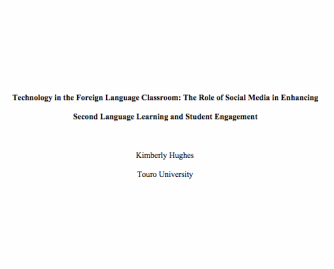 The purpose of this study was to discover how social media tools could be used in a high school foreign language classroom and the impact of their use on student writing abilities in the target foreign language. 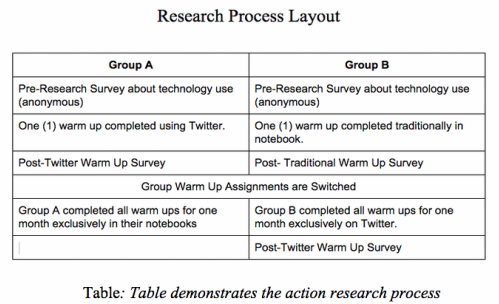 From this coursework and research process, I was also inspired to not only look at social media, but also other types of tech tools that can formatively assess student learning. Click HERE to read my entire paper which includes my findings and results, references and a literary analysis. A challenge many foreign language teachers face is the incorporation of technology into lower level classes. The term “lower level” refers to the criteria of the American Council on the Teaching of Foreign Languages (ACTFL, 2012) proficiency guidelines which set the following levels of proficiency: superior, advanced, intermediate and novice, along with sub-categories in each level. According to ACTFL, Spanish levels 1, 2 and 3 range between the novice and intermediate-low to intermediate-mid ranges, while upper level classes like Heritage Spanish and Spanish 3 and 4, are in the intermediate-high to advanced ranges. When one thinks about technology in a general sense in the classroom, the first things that may come to mind are creating digital presentations or doing in-depth research on specific topics. However, in the lower levels of a Spanish or French class, students simply do not have the language capabilities to complete either of these tasks in the target language yet. The issue of how teachers can provide lower level foreign language students opportunities to use technology in the classroom while simultaneously ensuring that these technologies keep students engaged and enhance their abilities to write in the target language is foundational to this study. Language learning is typically done face-to-face and is extremely social in nature. This leads to the question of how can social media technology make the learning experience an authentic one for our digital native learners? Moersch, C. (1995). Levels of technology implementation (LoTi): A framework for measuring classroom technology use. Learning and Leading with technology, 23, 40-40. Sheingold, K., & Tucker, M. S. (1990). Restructuring for Learning with Technology.